Seattle, Washington is a town that wears many hats. It's the home to the EMP museum, it's the birth place of grunge music, and is also home to some of the best coffee outside of Ethiopia and Columbia. Although it rains a lot, there are definitely many upsides in regards to visiting this incredible city! In a city so full of culture, it's no wonder the people are so cool. From famous landmarks like the Space Needle to a wide array of art and history and science museums, to beautiful scenery, to outstanding bars and restaurants, the Emerald City is a city that has it all. Here at Party Bus Seattle, we do our best to live up to the reputation that the city has for being one of the coolest and most down-to-earth places on the planet. We offer one of the biggest fleets of luxury vehicles in the state and we provide service the that goes above and beyond the expectations of our clients. We have just about every type of vehicle option imaginable. 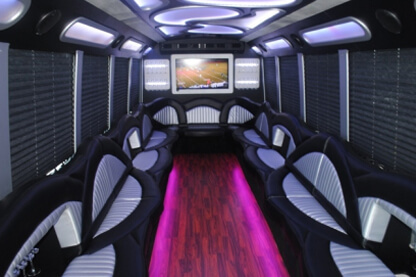 Not only are we the number one provider of Seattle limos, limo buses, and party vans, but we also have a great array of motor coaches and shuttles buses. We have an option to suite any need and budget, so don't hesitate to call us with any of your transportation needs! As you can see above, vehicles are truly outstanding. Each interior is custom and unique, but all of the great features are still there. 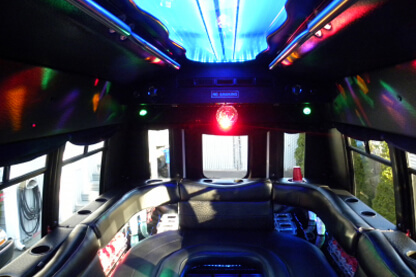 Colorful lighting effects, plush leather seats, coolers, TVs, booming stereos, DVD players and CD players, just to name a few! Because of the wide range of features found in each vehicle, they're versatile enough to accommodate the needs to any group, no matter what the mood or theme of the event. Turn on the colorful lights and pump the music, or put on a movie! Fill the cooler with adult beverages, or if it's a kid's party stock it with juice! Dance or sit back with a glass of wine. Whatever you're in the mood for, the features are there for you to enjoy. It may seem at first like luxury transportation like this would be out of budget, but that isn't the case! Our prices are reasonable and competitive so we're confident you won't find prices like ours at a company with comparable vehicles! Likewise, you won't find a company in our budget level with vehicles as nice as our. Plus we never add hidden or surprise fees at the last minute. Our costs are upfront and honest. You'll be pleasantly surprised at how affordable luxury transportation can be. Give us a call or send us a message to learn more! We operate 24 hours per day, 365 days per years, so we're when you need us, for whatever you need us for. You can call us with questions or to get a quote or you can schedule your limo rental for any time. This is luxury transportation on your time.